Landfill gas is comprised of methane, carbon dioxide, water and other organic compounds. The Landfill Gas (LFG) System on site collects and controls gas emissions through a network of wells connected by pipes below the surface that convey the gas through a vacuum. Once collected, the gas is processed to pipeline quality (recovery for domestic energy use) at an on–site LFG recovery plant. Gas emissions, non–methane organic compounds (NMOCs) and other hazardous pollutants are reduced by almost 100%. LFG and its odor are prevented from entering the atmosphere. In addition to this active gas collection and recovery system, an additional safety system is in place to prevent the migration of gas off–site. Leachate is the liquid by–product of the breakdown of household waste. Once the final cover is placed on the landfill, the quantity of leachate produced diminishes considerably because the amount of water that comes in contact with waste is minimized. The goal of the leachate management system is to remove pollutants by containment, collection and treatment of leachate before it reenters the environment. All treated water is cleaner than the nearby Arthur Kill. The four mounds at Fresh Kills are the result of over 50 years (1948 – 2001) of landfilling municipal solid waste. By 1997, two of the four mounds were closed and covered with a thick, impermeable cap. The remaining mounds stopped accepting waste in 2001. Their capping began in 2007, east mound was capped in 2011, and the last remaining is expected to be complete by 2021. The final cover placed over the solid waste is constructed in phases. The essential design goals are hydraulic performance, slope stability and long term integrity or durability of the landfill and its systems. These are achieved by minimizing surface water infiltration, preventing erosion, promoting proper surface water drainage, and separating the waste layer from the environment to protect public health. The final cover also captures and prevents the emission of air–polluting gases. The final cover is made of a series of layers, each with distinct functions, which are described below, from bottom to top. For a printable version of this information, see our Landfill Infrastructure guide. The Soil Barrier Layer covers the garbage and makes sure the hills are stable. This layer, sometimes called the cover foundation level or sub–base, is laid over the solid waste, graded and compacted to the appropriate angles. Before the final cover is placed on the landfill, slopes may need to be adjusted to meet the minimum and maximum required grades (4% to 33%) set by the New York State Department of Environmental Conservation (DEC) to maintain slope stability and promote proper drainage. The Gas Vent Layer allows the landfill gas to get captured by underground wells. The gas is sent to a plant where it’s made into gas that people can use to heat and power their homes! This layer is constructed of a geocomposite to facilitate the movement of landfill gas toward the landfill gas vents or extraction wells. 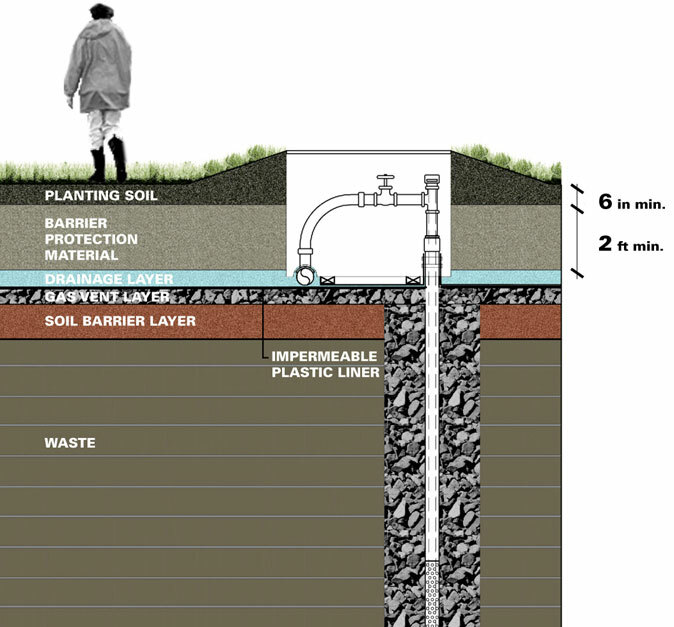 The Impermeable Liner prevents water from entering the landfill and forming leachate. The liner also prevents landfill gas and its odors from escaping. This is the most crucial component of final cover. It prevents water from entering the waste, both directly by stopping the flow of water and indirectly by promoting storage or drainage of water in the above layers. This layer also prevents the upward flow of gas into the atmosphere except in controlled places. It is made of low–permeability clay and/or plastic material. The Drainage Layer drains water off the hills to help keep them stable. This layer reduces the pressure of water on the barrier layer and increases friction, thus reducing the risk of sliding. It drains the overlying protection layer, increasing water storage capacity and reducing the risk of over–saturating the cover soils above. The Barrier Protection Material Layer protects the landfill cap and adds a layer of clean soil that is safe for park visitor use. This layer protects from extreme weather that could cause the underlying layers to crack or heave. This layer stores excess water until it is either used by overlying plants or drained off. It has a minimum thickness of 24 inches, and more where trees are to be planted. The Planting Soil Layer is where native grasses and plants grow. These plants prevent erosion and serve as a habitat for wildlife. The layer must have a minimum thickness of six inches. The soil used is a sandy loam, selected for its potential to prevent soil erosion and to provide suitable growing medium for the vegetation layer. The primary objective of the vegetation layer is to protect the integrity of the final cover through erosion control. A network of plant roots hold onto the soil, providing stability. View the printable version here.